On our tropical honeymoon, we will witness incredible views of the Atlantic Ocean with parasailing! Hilton Marco Island Beach Resort & Spa offers state-of-the-art boats and equipment, along with professional captains and crew, not mention tons of excitement. We will feel the sun on our shoulders and the wind in our hair as we explore the pristine backwaters of the Ten Thousand Islands on the unique one hour and thirty minute long tour. We will experience the native wildlife that resides in the mangrove forests while the expert tour guides highlight interesting facets about the nature and geography of the region! We will embark on this unforgettable Dolphin Watch & Shelling Tour aboard the Calusa Spirit as it departs directly off the hotel beach and transports us to one of the undeveloped beaches of the 10,000 Islands. 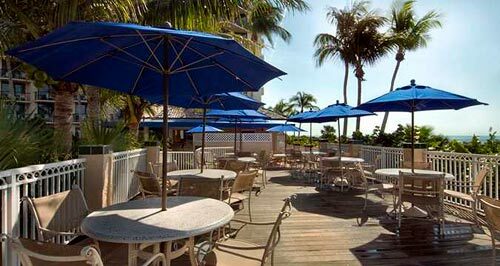 We will enjoy views of the Gulf of Mexico while watching playful dolphins in their natural habitat. We can’t wait to partake on this exciting adventure! 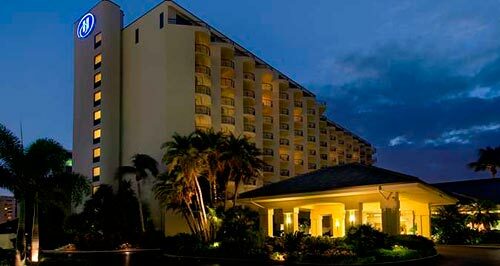 Hilton Marco Island Beach Resort and Spa features two Har-Tru Clay tennis courts with rental equipment available to us. We will get some fresh air and exercise as we take advantage of the additional services such as lessons, clinics, drills, playing sessions, and more! 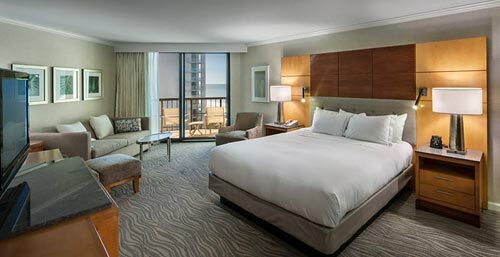 In our King Bed One Bedroom Gulf Front Suite, we will enjoy an additional separate living and dining area, and views of the Gulf of Mexico from our furnished balcony. Our beautiful suite also offers two 32 inch LCD HD flat panel TVs, a luxurious Hilton Serenity Bed with LED lighting just in case we choose to dive into a good book, a sleeper sofa, in-room safe, refrigerator and work desk. We will be spoiled with deluxe bathroom features including a separate granite vanity area, Peter Thomas Roth bath amenities and a walk-in shower! Help us indulge in true luxury on our romantic getaway. 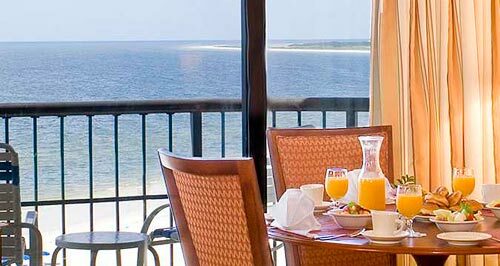 In this amazingly spacious suite, we are offered a king bed and a southern view of the Gulf. We have the pleasure of enjoying an open floor plan with a bedroom and sitting area and the benefit of one and a half baths. Our room features a luxurious Hilton Serenity Bed with LED lighting for reading, a 32” LCD flat panel TV, in-room safe, ample closet space, refrigerator, and work desk. The main bathroom features Peter Thomas Roth bath amenities and a walk-in shower with deluxe showerhead. 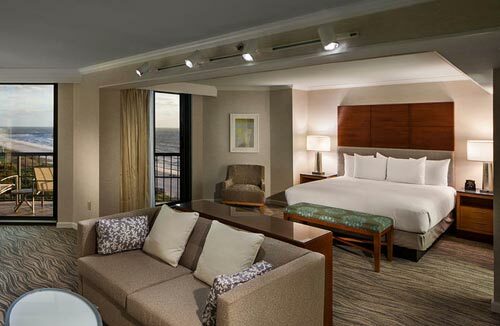 We can’t wait to lounge in our open room as we gaze into the wide view of the Gulf’s sunset! On our romantic honeymoon at Hilton Marco Island Beach Resort and Spa we will experience pure luxury with room service for a breakfast in bed, a sumptuous lunch, a private dinner or cocktails for two. We will choose from a menu featuring a variety of selections to make our honeymoon that much more memorable from the comfort of our room! 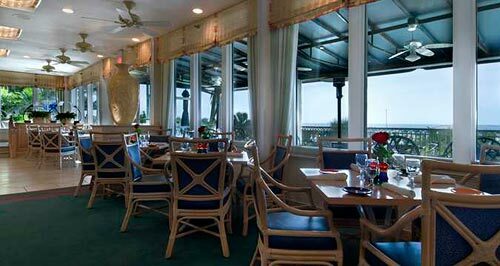 We will experience the hotel’s award winning Sandcastles Restaurant. 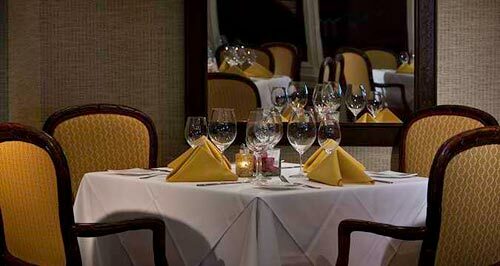 Here we will savor the Chef’s tantalizing Caribbean inspired menu. Sandcastles dining room is perfect to make unforgettable honeymoon memories during an evening of elegant surroundings and enjoying local delicacies. We will taste the tropical flavors of the Caribbean! Before we enjoy a one of a kind meal at the Sandcastles Restaurant, we will relax at the Sandcastles Lounge where a Piano Bar awaits us. 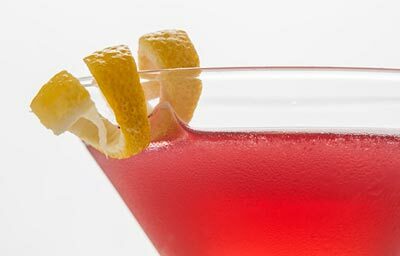 The Sandcastles Lounge is the ideal spot for us to savor our favorite cocktail! 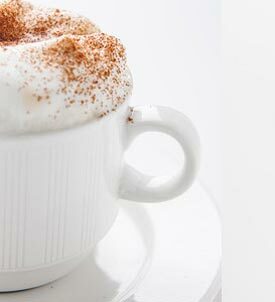 We will grab a bagel or muffin to go on our busy day full of exploring the sea or the city! Who needs a lavish breakfast when we can enjoy a simple cup of brewed Starbucks Coffee as we go hand in hand, reveling in the romance that awaits us at every corner? At Paradise Café, we will enjoy an amazing view of the beach as we partake in informal dining for a buffet breakfast, lunch or dinner. If we feel adventurous on a Friday night, we will indulge in their delicious seafood buffet or we can wait till Saturday night for the Italian Buffet! At the Beach Club Bar and Grille, we will enjoy a tropical drink and lighter fare after a quick dip in the pool or Caribbean Sea, as we relax while watching one of the large screen plasma TV’s or gaze upon the magnificent sunset. Thanks to your wonderful wedding gift, we will experience extra indulgence on our romantic honeymoon at Hilton Marco Island Beach Resort and Spa! We will thoroughly enjoy our time while we play a game of tennis in one of their two Har-Tru courts or relax at the luxurious full service Spa and fitness complex. We can explore the private beach while aboard the 10,000 Islands Guided Waverunner Tour, Parasailing or a Dolphin-Eco-Shelling Trip on the “Calusa Spirit” power catamaran. After a long day of exploring our surroundings, we can relax at the poolside Beach Bar & Grill while we sip our favorite cocktail and watch the sun go down! This resort credit will truly enhance our intimate escape in paradise! 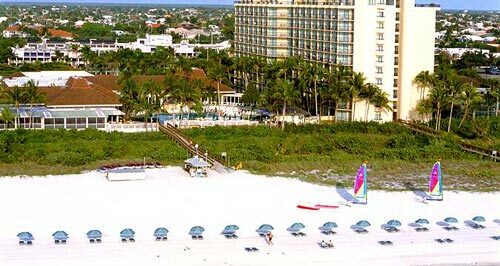 Located in the beautiful Southwest coast of Florida, Hilton Marco Island Beach Resort and Spa promises us a romantic honeymoon getaway! With your thoughtful gift, we will discover the many nearby attractions such as the Florida Everglades National Park, Naples Zoo, Naples Pier, The Village on Venetian Bay, not to mention plenty of fine shops and restaurants. We can also throw ourselves into a challenging round of 18 holes at one of the nearby world class Championship golf courses! We will celebrate our new lives together with a wonderful night out on the town or a charming night in with an array of lavish amenities in a beautifully designed suite in the stunning surroundings of Marco Island, Florida! 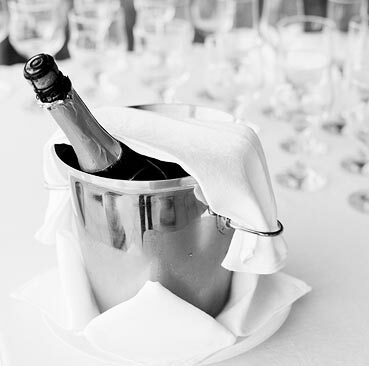 A chilled bottle of champagne will be delivered to our suite. We will make a toast to our romantic honeymoon in paradise while taking in the sweeping views of the Atlantic Ocean from our balcony. How romantic! A bottle of our favorite wine will be delivered to our room or suite. We will make a toast to our honeymoon while taking in the enchanted views of the open sky reflecting upon the green and blue waters. We will discover romance at its best! 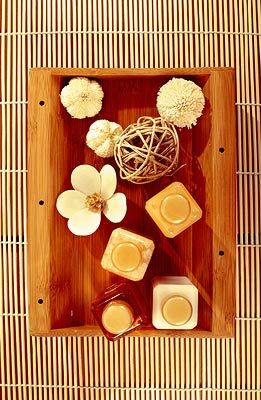 The Spa Signature Massage is a gentle, rhythmic massage administered to relax soft body tissue using Swedish techniques to facilitate healing. It is lighter in touch and includes long flowing strokes, kneading and friction techniques on more superficial layers of the muscles. It can loosen stiff joints, reduce muscle tension and help clear nasal or chest congestion. I will indulge in utter relaxation on my honeymoon! This Deep Tissue Sports Massage uses many of the same movements and techniques as Swedish massage, but the pressure will be more intense as the therapist will be going deep into the muscle tissue. The therapist will work to release chronic muscle tension or knots. With all the exciting adventures I will be going on during my romantic getaway, I will need some definite muscle relaxation! As a way for me to relax, I will treat myself to the famous Hot Stone Massage. Warm stones will be used to heat my body and release muscle tension. The stones will then be placed along chakra centers, as well as on my hands and feet. As the stones deliver concentrated centers of heat, my therapist will simultaneously massage my body with oiled, heated stones. In order to revive and relax myself after a long and uncomfortable flight, I will receive this amazing treatment! I will get up to speed across times zones with this invigorating and rejuvenating treatment, packed with body boosting essential oils, and physical manipulation and sport massage techniques. This will surely be one of the highlights of my trip. With applewater, aloe and macadamia oil all working together in this facial, my parched skin will appreciate the much needed gulp of water. My skin will be left feeling soothed and cool after I am drenched in a veil of rich, healing creams to help my skin stay plumped and hydrated throughout my busy day! After a long day in the sun, my skin will be in definite need of some R&R. This facial is specifically designed to cool sun burnt and blistered skin. I will relax while my skin is transformed from pink and painful to hydrated and healthy. This treatment uses special cooling products and a relaxing cold stone massage of the face, neck and décolleté. During this unique body polishing, an exfoliating body polish will leave my skin soft and velvety. Bora Bora white sane infused with lotus flower extract promotes natural glowing skin and leaves a luxurious delicate scent. I will feel refreshed, rejuvenated and ready to embark on the next honeymoon adventure. 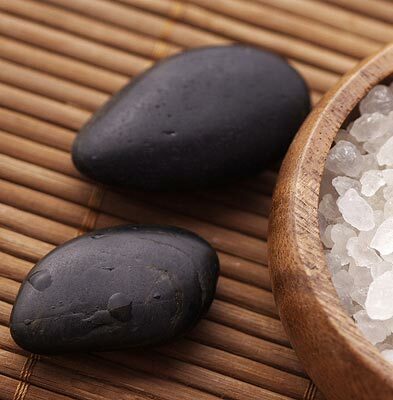 I will sink into an uplifting, aromatic hand and foot soak followed by a smoothing and refining olive oil grain scrub. After a skin-softening and hydrating wrap, layers of deeply nourishing gels, oils and creams will be applied to my upper arms and lower legs with a soothing massage. These intensely conditioning treatments will work wonders on my dry, stubborn cuticles and cracked and hardened heels. With this deluxe package, we will experience the Gulf Coast of Florida in the perfect setting for our romantic island getaway. We will indulge in our Spa Signature Massage in the couple’s room, as well as the Spa Signature Facial and an Exclusive Gentleman’s Treatment Facial. 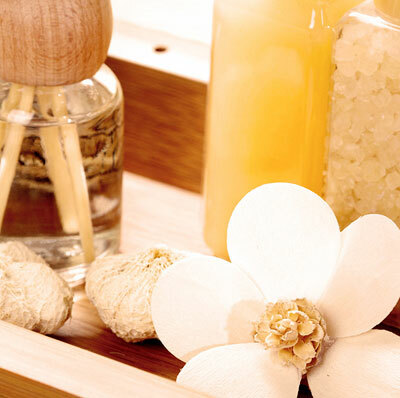 There will also be a Spa Signature Manicure and Pedicure for the ultimate goal of complete pampered relaxation.